In the last entry to the Water Stewardship Academy, we discussed the various types of water risk that companies face. For most, the next question is: How do we understand whether water poses risks to our business, to what extent, and in what ways? Here we offer the basics to help your business do just that. There are many free, online tools – namely Ecolab’s Water Risk Monetizer, WRI’s Aqueduct Water Risk Atlas, and WWF’s Water Risk Filter – that help companies understand the extent and type of their water risk. These are all great, easy-to-use, practical tools. However, all of these tools use facility locations as a critical component of their risk assessment. As such, all companies with a serious interest in assessing risk should compile the locations of all relevant facilities, either in latitude/longitude format, state or province, or by river basin. You’ll need to decide which locations you want to include in your risk assessment. At a minimum, you will want to include any facilities that your company owns or operates. Ideally, you will also include all water-intensive or water-polluting suppliers, whether they are manufacturers or agricultural sites. For many companies, the vast majority of their water footprint and water risk is located beyond the direct operations in their supply chain. The more facilities you include, the more robust your understanding of your company’s water risk. Once you have collected your location data, you are now well prepared to use the many free online water risk assessment tools to get a high-level understanding of your risk exposure. This high-level assessment will be based on two primary factors: 1) industry sector and 2) location. Many water risks are not necessarily due to a company acting in an irresponsible or unsustainable manner, but simply because their industry sector is highly dependent on water. As such, no matter how efficient or clean their processes may be, there will always be a risk of disruption due to drought and other water challenges. Examples include the food, beverage, and apparel industries. These industries will always rely on water and thus always experience water risk, at least to some extent. The table below lists industry sectors that are typically exposed to at least moderate water risk. By the same token, some companies will always face low to non-existent water risk due to the nature of the business. Even in the face of drought and severe pollution, their core business activities will likely not be significantly affected. Examples include software development, digital media, and financial services. To assess your company’s exposure to risk based on its industry sector and other company-specific data, we recommend WWF’s Water Risk Filter. 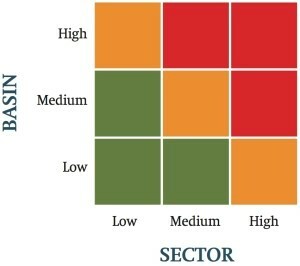 In it, your “Total Company Risk” score will give you insight into your risk exposure based on industry sector. The other factor that directly affects your exposure to risk is the hydrologic, regulatory, and social context in which your business operates. Again, you can be the most water-efficiency company in the world, but if other water users in your basin are inefficient your water supply may still be vulnerable and unsustainable. Similarly, you can have advanced wastewater treatment plants, but if nearby facilities do not, you may still be intaking highly polluted water. As such, most online risk tools assess facilities’ water risk based on the overall water stress of the river basins in which they are located. To assess your company’s exposure to risk based on the water stress of the river basins in which it operates, we recommend WRI’s Aqueduct Water Risk Atlas. When used in conjunction, these tools offer powerful insight into the extent to which the world’s water challenges affect your business and how. 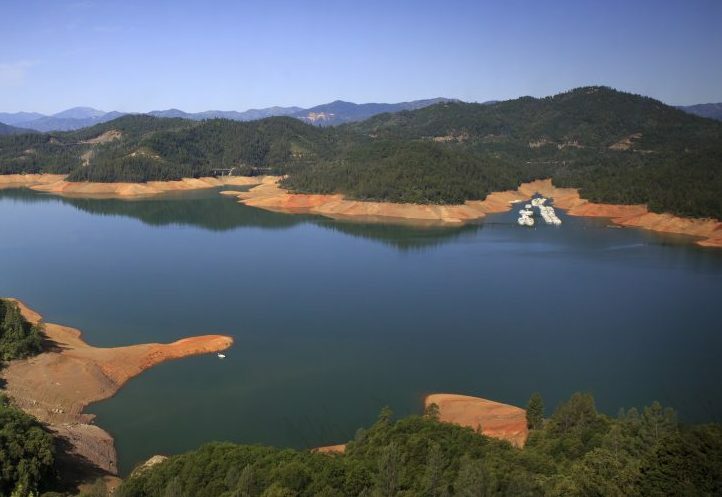 Generally speaking, if you are in an industry sector with medium-to-high exposure to water risk, you should seriously consider pursuing water stewardship. Likewise, if you have many water-intensive or water-polluting facilities in high-risk river basins, you should strongly consider implementing water stewardship. Up until now, your risk assessment has been geared toward understanding whether your business generally is exposed to significant water risk based on its industry sector and location(s). Next, you’ll want to begin prioritizing specific facilities with the highest risk exposure, while also understanding what type of interventions will be strategic and relevant at those locations. Some may require that you focus on internal operations, while for others intervening in local governance may be more relevant. Some more require that you focus on water use efficiency, while others may benefit more from improved wastewater treatment. You can begin prioritizing facilities based on the tools we’ve already mentioned above. WRI’s Aqueduct and WWF’s Water Risk Filter can both help you understand which facilities are most exposure to water risk based on their river basin context, and whether that risk is related to water quality or water quantity and whether it’s physical, regulatory, or reputational in nature. From there, Ecolab’s Water Risk Monetizer is ideally situated to begin prioritizing action amongst your various facilities based on their importance to your bottom line. In fact, the tool prioritizes all your facilities in this way for you. Use this tool to both communicate the value of water stewardship to your colleagues and stakeholders and to begin creating a short-list of priority facilities to focus on. The Smart Water Navigator is based on a simple, 13-question assessment that offers a practical guide to smart, sustainable water practices, providing a roadmap that will help your facilities improve the way they use water. All three of these online risk tools are invaluable to any risk assessment process. They will help you understand whether water is material to your business and in what ways, while also helping you create a short-list of priority facilities. These steps are essential for any robust water stewardship strategy. However, once you’ve done so, the journey is only beginning. Every river basin in unique. While water efficiency and wastewater treatment are always helpful, there is no “one-size-fits-all” approach for water stewardship. Since risk comes in different shapes and sizes, so too will the responses to address them. Developing a truly sophisticated and comprehensive understanding of the water risk at your various facilities will require an in-depth analysis beyond what any global online tool can provide. It will require that you engage with facility managers, local government official, local NGOs, and other key local stakeholders. Only through such engagement can you begin understanding the unique nature of water challenges in your priority river basins, what solutions will be most strategic and effective for those specific locations, and what role your company can and should play in advancing those solutions.